New Scrabble Dictionary For A New Generation Hasbro and Merriam-Webster have freshened the 70-year-old reference book by adding 300 new words to The Official Scrabble Players Dictionary. 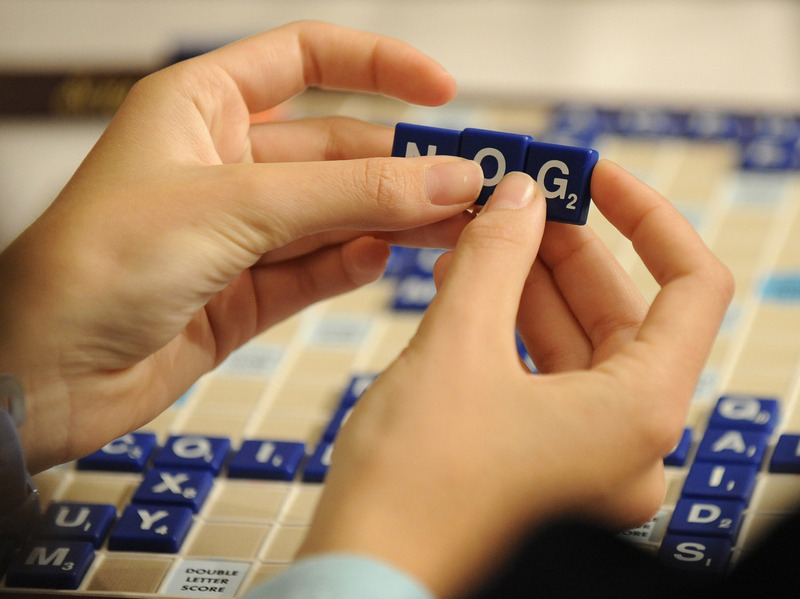 A competitor arranges letter tiles while competing in the 2008 National School Scrabble Championship, in Providence, R.I. On Monday, Merriam-Webster published a revised version of the Official Scrabble Players Dictionary, adding 300 new words. The dictionary is a reference book for players of the popular crossword puzzle game produced by Hasbro. This is the sixth edition of the dictionary, which was first published in 1976 and is updated only once or twice a decade. The prior edition was published in 2014. "Scrabble has been a game night staple for 70 years, and we're excited to bring the game into its next decade with hundreds of current words like facepalm and emoji," said Hasbro's Jonathan Berkowitz in that release. "Additions like these will add a new layer of fun to game night, making game play even more entertaining and relevant." Another Merriam-Webster dictionary defines a lexicographer as somebody who authors and edits dictionaries. As a lexicographer and editor at large at the company, Peter Sokolowski sees some of the Scrabble additions as representative of broader trends in modern language. "I think ew is interesting because it expresses something new about what we're seeing in language, which is to say that we are now incorporating more of what you might call transcribed speech. Sounds like ew or mm-hmm, or other things like coulda or kinda. Traditionally, they were not in the dictionary but because so much of our communication is texting and social media that is written language, we are finding more transcribed speech and getting a new group of spellings for the dictionary," Sokolowski told the Associated Press. Ew joins 106 other two-letter words in the official dictionary. Two-letter words are highly regarded in the competitive Scrabble community. "A thorough mastery of two-letter words is among the most important skills necessary in the creation of a successful and incomprehensible Scrabble board. The ability to add seemingly random letters to existing ones will allow a player to enjoy far greater latitude in placing their words on the board," according to Merriam-Webster. On Hasbro's website, the company's answer to the commonly asked question, "How can I improve my Scrabble game skills?" is learn the two-letter words and the three-letter words that can stem from them. "By learning and taking advantage of these few hundred words you will probably increase your scores at least 50 points per game," the FAQ page tells players. "OK is something Scrabble players have been waiting for, for a long time," Sokolowski told the AP. With the letter "K" being worth 5 points and "O" adding an additional point, the two-letter word is easy to play and, if played strategically, can rack up the points. The North American Scrabble Players Association uses The Official Scrabble Players Dictionary for the vast majority of its tournaments. "The competitive players within the North American [Scrabble Players] Association treat it with a proprietary sense. It is their own," co-president of the association John Chew told NPR's Here and Now in 2014, when the dictionary was last updated. Used mostly in North America, the Official Scrabble Players Dictionary is augmented for tournament play to include words "not sanitized to protect children and sensitive players," according to a 2015 New Yorker feature. With those inclusions, what is called the North American tournament word list expands to almost 190,000 usable words. Across the pond and beyond, English-speaking players and tournaments are more likely to use Collins Scrabble Words, published by Collins Dictionary. That list has over 276,000 words, including twerk, which was added in 2015, as reported by NPR's Bill Chappell. However, there are some exceptions to what can be added to any Scrabble dictionary or word list, as outlined by the game's publisher, Hasbro. "Before the game begins, all players should agree upon the dictionary that they will use, in case of a challenge. All words labeled as a part of speech (including those listed of foreign origin, and as archaic, obsolete, colloquial, slang, etc.) are permitted with the exception of the following: words always capitalized, abbreviations, prefixes and suffixes standing alone, words requiring a hyphen or an apostrophe," states the company's rulebook. "No, LOL is not a word, OMG is not a word," Crew said in his 2014 interview, and, based on Hasbro's current rules, they will likely never appear on any official Scrabble list. So, if you want to avoid some PO'd friends on your Scrabble app and a flipped game board IRL, abbreviations like these should probably be avoided, TBH. A previous version of this story incorrectly said the letter K is worth 4 points in Scrabble, rather than 5.